In an expected yet shocking turn of events, given the recent political mess that was the Tibetan elections, it has emerged that not just one but BOTH of the Tibetan leadership’s State Oracles are upset with the Tibetan leadership. Since they entered exile in 1959, the Tibetan leadership have relied on the pronouncements of three State Oracles – Nechung, Tsering Chenga and Gadong. After the death of the Gadong Oracle in 2015, the leadership continued their reliance on the Nechung and Tsering Chenga Oracles. This latest embarrassing episode to go down in the leadership’s annals follows the release of a short clip making it clear that Tsering Chenga was distinctively upset with the Tibetan leaders. Taking trance in the Nechung Monastery in Dharamsala, she publicly chastised both Sikyong Lobsang Sangye (Prime Minister) and Penpa Tsering (Speaker of the Tibetan Parliament in Exile) together with other members of the Central Tibetan Administration (CTA) for their lack of integrity, disharmonious behaviour and corruption during the recent electoral campaigns and for their overall method of governance. Penpa Tsering, for example, has a history of criticising high lamas and teachers, and of making derogatory comments about them for political purposes. Because it is in vogue to criticise certain teachers, Penpa Tsering denigrates these masters in order to pander to certain sectors of Tibetan society so that he can gain popularity points with them. Leaders and ordinary people have ignored their promises taken in front of His Holiness. Number of guidance and initiatives of His Holiness in his political career were not properly understood by them. They are also not being grateful to what His Holiness did and not actually implicating what His Holiness advice us to do. This has sadden His Holiness. Like Sun couldn’t be covered by hand, Popularity of His Holiness the world is unstoppable. But, due to lack of Sonam [merit] and fortune, if we continue to have lack of unity and harmony in Tibetan community, I would not be able to bear the responsibility of His Holiness lifespan and security. Therefore, in the future If you are not able to give assurance to His Holiness about your rightful intention ahead, you Leader should take all the responsibility regarding life expectancy of His Holiness. Thus, you should personally approach to His Holiness to regretfully apologized for all the mistakes and promise not to repeat again. As I predicted earlier, Happy days for Tibet will come in his life time of my beloved Guru His Holiness. There is no better option other than Umay Lam [Middle Way Approach] for this to achieve. Therefore, irresponsible talking in the society will have more harm than help and you all should be UNITE. There is great interest in this event among ordinary refugee Tibetans who have lived under the yoke of the Tibetan leadership for over 60 years because it seems that the leadership’s own gods are finally turning against them. For example, a Facebook post on an ordinary Tibetan’s page about this event has been shared 779 times. This person is just an ordinary citizen but the number of times their post has been shared reflects a huge interest in the oracles’ upset over the politicians’ behaviour. 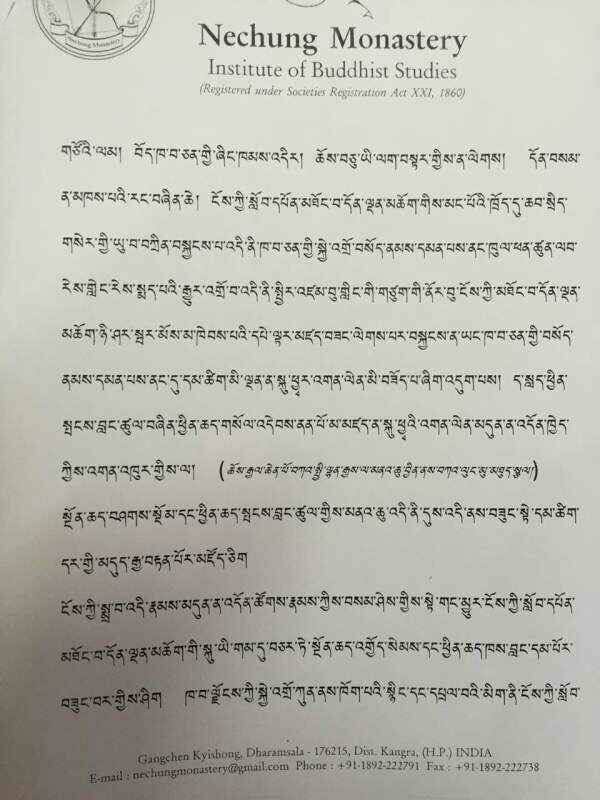 Thus with the video of Tsering Chenga’s violent chastising and with Nechung‘s letter, one can clearly see the State Protectors’ disapproval for the disgraceful behaviour of both Lobsang Sangye and Penpa Tsering during the election. Manifesting wrathful manner through the State Oracle, Nechung scolded both politicians for their general and overall corrupt behaviour, and their unbecoming actions that showed little consideration for His Holiness the Dalai Lama’s poor health that required him to undergo treatment in the Mayo Clinic during the time of the elections. Both politicians were obviously taking advantage of His Holiness’ absence from Dharamsala for their own benefit. These corrupted officials of the Tibetan leadership have made it a habit of using religion, His Holiness the Dalai Lama, tulkus, monasteries, Dorje Shugden and regionalism for their own personal gains. What do they get from this? Money and power. So it is strange and hypocritical that they should accuse Dorje Shugden practitioners of taking money from the Chinese leadership, when they themselves take money from other governments to fulfil their own selfish wishes, at the cost of the Tibetan people’s welfare. They carry out the same practices that they accuse others of, so what gives them the authority to direct accusations against anyone? Unfortunately for the Tibetan leadership who have suppressed their people for too long, the circulation of the video and letter shows no signs of slowing down. These recent events have empowered Tibetans to speak up and make sure their varied voices and opinions are heard. This is something previously unthinkable in Tibetan society. Comments on social media range from snide remarks at the continued use of oracles for political matters (for example – “Abhay Oracles Saheeb. What should I have for dinner? Momo or Thukpa?”) to the minority still in favour of oracles (for example “Hey everyone don’t say things about the oracles and deities of Tibet. They are the guardians of our Tibetan Buddhism and they only mean well and protector of his holiness…”). Politically, however, these comments show there is public consensus regarding the disgraceful electoral process – almost everyone is in agreement that the Tibetan leadership is corrupt, starting with Sonam Choephel Shosur (Chief of the Election Commission) who acted highly improperly by changing the rules of the election after the preliminary ballots to ban Lukar Jam Atsok from the second round. Ultimately, what has captured the Tibetan public’s attention is the very fact Tsering Chenga and Nechung would even rebuke their leaders. And remember – all of this is happening while His Holiness the Dalai Lama is alive. Imagine what will happen when His Holiness the Dalai Lama is no longer around. It would be the fall of the Tibetan empire or the remnants of what is left of it. So these incidents have made the Tibetan public sit up and really question what their leaders could have done so wrong that both deities would be so violently upset with them. Both Nechung and Tsering Chenga are deities known to be very loyal to His Holiness the Dalai Lama. Therefore, for them to express their displeasure towards the Tibetan leadership and the Central Tibetan Administration implies that the leaders have been involved in actions against the instructions and perhaps conflicts with the interest of His Holiness the Dalai Lama. Exactly how they counteracted these instructions, we do not know, but it is obvious from the manner in which the electoral process was handled, we can see that corruption, manipulation and unfair treatment is the modus operandi of the Tibetan leadership. Even Congressman Dana Rohrabacher was so upset by this corruption, he was moved to write a letter of complaint to the Tibetan leadership. Why? Because such corruption does not develop spontaneously overnight; such corruption is an insidious threat that must have been growing and nurtured for a long period of time, to such a point even gods loyal to the Tibetan leadership cannot tolerate it any longer. One by one, those formerly loyal to the Tibetan leadership are speaking up against the behaviour of their leaders. Their manipulations and exploitation of the people has not gone unnoticed by either the gods or men. For the men, they are expressing their displeasure and frustration with increasingly descriptive and insulting remarks. And now the gods have spoken too and it has been caught for all the world to see. Who will the Tibetan leadership run to when they no longer have His Holiness the Dalai Lama and the gods to hide behind? One by one, Dharamsala’s allies fall by the wayside as their sixty years of hypocrisy, greed, embezzlement and exploitations of their people catch up with them. Proof? They have not secured independence, autonomy or any leeway for the six million Tibetans in Tibet in their talks with the Chinese. If the current political situation continues, what the gods and the disenchanted Tibetan people will do next…only heaven knows. Can such a corrupt government who promotes schism, factionalism and untruths be trusted about the ban against Dorje Shugden? It leads us to believe that everything they say about Dorje Shugden is a lie and for political gain. Below is just a sample of the current wave of interest by the Tibetan people in this latest development where even the Tibetan leadership have lost the respect of their own, state-approved, ‘clean’ and non-controversial gods. This is the letter and decree by the Nechung Oracle currently circulating on WeChat and other social media platforms. This was the posting that was repeatedly sent to us by various Tibetans who want to make it known to the world how the Tibetan leaders are failing their people, and that even the State Protectors recognise this and are losing their patience. Thanks to WeChat and other social media platforms, the video of Tsering Chenga berating Sikyong Lobsang Sangye and Speaker Penpa Tsering has been shared all over the Tibetan world. In this particular posting, the video is accompanied by the letter from the Nechung Oracle chastising the two leaders. Notice that this Facebook post has been SHARED 779 times (at the time of publishing). The news regarding Tsering Changa’s rebuking Lobsang Sangye and Penpa Tsering was also shared on the New Yak Times Facebook page. Although the New Yak Times is relatively satirical in nature, the Nechung letter is very much real as are the comments made by the Tibetans about the oracles. Just look the remarks they make, which would have been unthinkable in the past when the oracles were held in extremely high regard. In fact, even a Facebook page like the New Yak Times, which pokes fun at the Tibetan leadership, would have been unthinkable just ten years ago. The Tibetans are clearly frustrated with their leadership who despite claiming to be democratic, continue to rely on oracles to divine their future. What other democratic nation in the world consults oracles and relies on them to make state decisions? Are the Tibetan leaders so ineffectual and indecisive, and so fearful of being held accountable for their decisions that they will not decide for themselves and need to rely on the gods? Religion is a personal matter and should not be used to influence state matters. There are, for example, Tibetan Bonpos and Muslims who fall under the purview of the Tibetan leadership. They do not share any beliefs with the Buddhists in their society so why are decisions regarding their welfare being made by a Buddhist protectoress who has nothing to do with their religion? So it is one thing to seek the blessings of the gods, and quite another thing to leave matters of national importance to them. The video of Tsering Chenga violently chastising Sikyong Lobsang Sangay and Speaker of the Tibetan Parliament in Exile Penpa Tsering has gone all over the Tibetan world. See here the comments the Tibetans make about her reaction to the two leaders, laughing at the Protector Goddesses’ reaction towards them (ཧ being the Tibetan character used to express “ha” in this case). 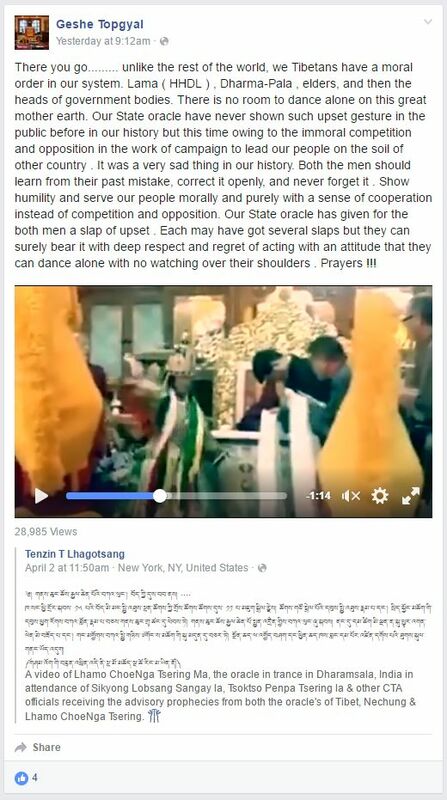 A Geshe Topgyal posted the Tsering Chenga video to Facebook, attributing Tsering Chenga’s behaviour and treatment of the two leaders to recent “immoral” behaviour during the Sikyong Elections. See what else he says about the two leaders’ behaviour. This Geshe states that the oracle has never previously shown so much upset and anger in public which is true. In the past, whatever decisions the Tibetan leadership made always received the support of the government’s oracles and deities. Penpa Tsering for example, even being an alleged murderer, has never suffered such a public berating for his behaviour. The behaviour of the two leaders has become so inexcusable and intolerable that the Tibetan leadership’s own gods are turning against them. As a direct result of the rebuke they received from the State Oracles, the Minister of Security for the Tibetan Government in Exile resigned from his post. This makes him the second Minister to resign from the Cabinet in a matter of months. Is this a government you can trust, when members of the Cabinet quit from their posts at the drop of a hat? First, Penpa Tsering stormed out of a Parliament session like a petulant child when he was accused of murder. Next, Dicki Chhoyang resigned so she could speak freely about the Sikyong elections. And now, Dongchung Ngodup quits too. Dongchung Ngodup says he quit due partly due to berating the government received from the State Oracles. Does this mean they agree with what the State Oracles said about them, that they have been ineffectual? Is this their way of saying that they lack confidence in Sikyong Lobsang Sangye’s leadership and instead of seeing out their tenure, they would rather quit? What is going on behind the scenes in the Tibetan leadership that is resulting in leading government officials resigning from their positions? The very protectors of the Tibetan government is speaking up angrily at the corruption of the Tibetan leaders. With leaders like this that enforce the Dorje Shugden ban, it is painfully obvious to see the ban is politically motivated. There is nothing wrong with Dorje Shugden but he is politicized for their selfish gains. The ban against Dorje Shugden should be removed. These corrupt leaders should resign. Tibetans inside and outside of Tibet will not benefit with the current ‘leadership’ from Dharamsala. Nechung and Tseringma shows this clearly in their wrath. This is what is happening while His Holiness the Dalai Lama is alive. Imagine if the Dalai Lama is no longer here? Everything for the Tibetans will just fall apart as it’s already happening now. It is really the slow but sure fall of the ‘Tibetan empire’ as mentioned in this well written article. The rot really starts from the inside. Penpa Tsering and Losang Sangye should release the ban against Shugden people and then do the honorable thing and resign. China does not need to pump money into creating problems within the exiled Tibetan communities, if they are even doing that, because the Tibetans are doing a great job destroying themselves. So many gullible Western Buddhists and sympathizers support the leaders of the exiled Tibetan government of Dalai Lama, but they are sadly being misled. Too bad. Why does the Dalai Lama keep quite about all this corruption? Why doesn’t he focus on rooting out the corruption with his government? This would be time better spent than vilifying the Dorje Shugden followers. So many Western followers and supporters will find this all very painful and start questioning themselves deeper why they support feudalistic human rights trampling leaders such as the Tibetan govt in exile (CTA). Westerns gave their money, time and hear to the Tibetan exiled govt and they wasted their time. So many Western followers and supporters will find this all very painful and start questioning themselves deeper why they support feudalistic human rights trampling leaders such as the Tibetan govt in exile (CTA). Westerners gave their money, time and hearts to the Tibetan exiled govt and they wasted their time. They will realize this now. DHARAMSHALA, April 4: In an atypical display of the Tibetan exile Administration and its more mystic affiliation, the top brass of the CTA has been reportedly reprimanded by the state oracle of Tibet Nechung Choegyal and the deity Tsering Chenga (Tashi Tseringma) for their conduct in the recently concluded general elections. 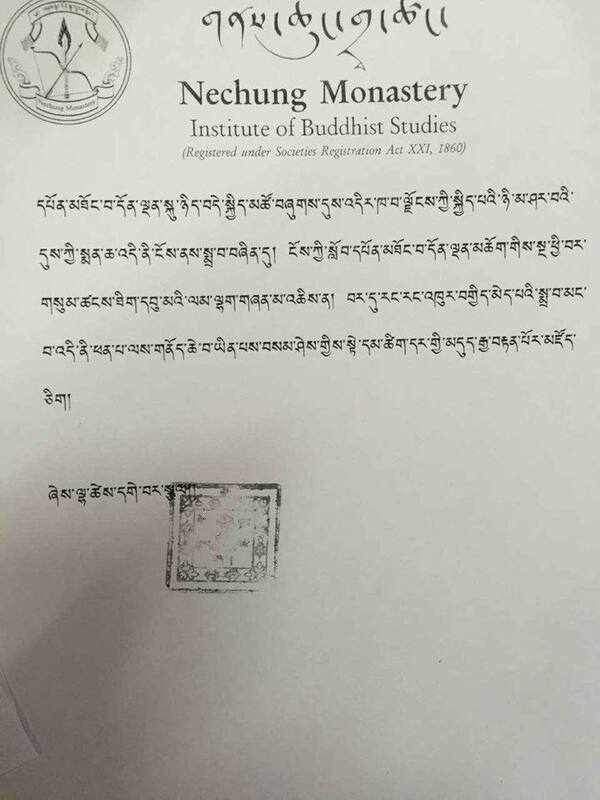 A prophecy letter on the official letterhead of Nechung Monastery condemns the “mishandling of the gift of democracy” besides the violation of the oaths taken by both Sikyong and the Speaker. 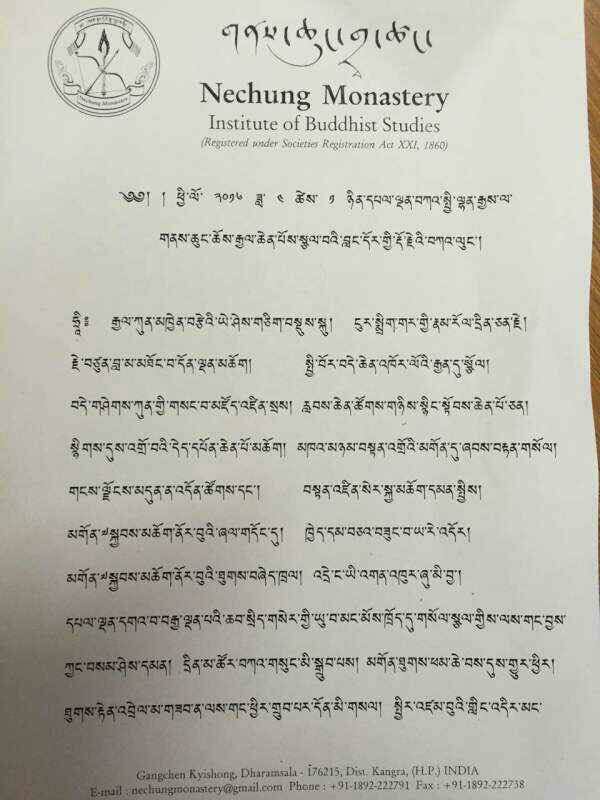 The letter warned that the mismanagements could lead to negative consequences on His Holiness the Dalai Lama’s health and life and directed the two to offer apology to His Holiness the Dalai Lama. The prophecy was made during a private audience of Nechung oracle and Tsering Chenga with the Tibetan PM, Speaker of the Tibetan Parliament and members of the 15th Tibetan parliament. Tibet.net, the official CTA website described the meeting as a ceremony to pay tribute to “the oracles for their guidance and counsel in the successful completion of the current Kashag and the Tibetan Parliament-in-Exile”. The cryptic speech of the oracle, as is practice, was transcribed and translated into formal Tibetan by the monastery. 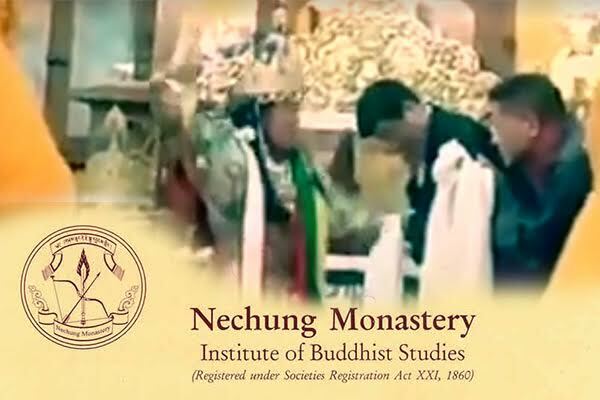 A video clip reportedly of the ceremony taken from a mobile device, which is circulating on social networking and micro messaging sites, shows Tashi Tseringma’s medium uttering an unknown dialect and hurling barley grains on the Tibetan PM and speaker of the parliament in an animated fashion. Tibetan writer and a staunch Rangzen (pro independence) activist Jamyang Norbu writes on his Facebook page, “As if Tibetan democracy hadn’t been totally discredited in the last few months, the Nechung and the Tsering Chenga oracles stepped in to finish the job with their sycophantic rantings on the Sikyong elections. Too depressing for further comment. I dismissed these absurdities by name long time ago (1999) in a two part essay: ENDURING PHOBIAS AND SUPERSTITIONS IN TIBETAN SOCIETY, that re-appeared some years later in the New Humanist published by the Rationalist Association of UK. I have reissued them on my blog Shadow Tibet. Nechung Choegyal is regarded as one of the two prime protective deities of Tibet. The spirit of the diety is believed to take resort in a human medium known as Nechung Kuten (Nechung meduim) on occasions when he is called upon by the Dalai Lama or when he intends to pass on a message. Historically, the Nechung oracle is believed to have assisted the government in decision-making and providing divinities on pressing matters of the state. DHARAMSHALA – Members of the 14th Kashag, led by Sikyong Dr Lobsang Sangay, Speaker of the 15th Tibetan Parliament-in-Exile, Members of Parliament and Secretary General of the Tibetan Parliamentary Secretariat observed a ceremony to pay respect and gratitude to Nechung, one of the two state oracle of the Central Tibetan Administration, and Tashi Tseringma during a private audience at Nechung Monastery, yesterday. The ceremony is a mark of tribute to the oracles for their guidance and counsel in the successful completion of the current Kashag and the Tibetan Parliament-in-Exile. Sikyong Dr Lobsang Sangay and Speaker Penpa Tsering received a private audience with the Nechung oracle and Tashi Tseringma. When the Dorje Shugden ban first came out, Nechung said by practicing Dorje Shugden it will shorten the Dalai Lama’s life. No master, scholar or Geshe believed that as it made no sense. But the ordinary Tibetan perpetuated this falsity. Now Nechung is saying because of the corruption of the Tibetan leaders in exile, Nechung can’t guarantee and safeguard the life of Dalai Lama. So now if anything should happen to the Dalai Lama, it’s not Dorje Shugden’s fault, but Sikyong Lobsang Sangye and Penpa Tsering’s fault? That is strange. Nechung is threatening Sikyong and Penpa? To add a further twist, if the official protector of Tibetan government and Dalai Lama is Nechung and if he cannot protect Dalai Lama, then what does he have left to do? What a mess this all is. They like to blame Dorje Shugden for everything negative and use him as a scapegoat, but look at the mess they themselves made. Both of these oracles are in the employ of the Dalai Lama. They go into false trances at the DL’s bidding. All this is was a public display that the Dalai Lama’s puppet oracles can control the two men running for the leaders position. They both know that the oracles are corrupt and do the DL’s bidding. If both oracles denounced one of the two men running the Tibetan people would like sheep follow the oracles and not vote for that man. This video was a display of the power the Dalai Lama and his paid oracles have in the out come of the next election. Notice the Gadong Oracle did not speak from 1986 to 2015 when he died. There is no Lamo Tsangpa Oracle since his death in 2003. All we have are these two corrupt puppet oracles who are doing the Dalai Lama’s bidding. 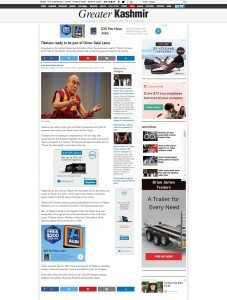 Oh my, looks like the threat to HHDL’s life is increasing! Maybe they should just ban the CTA, that would probably be a wiser choice as they have more ability to harm HH due to their lacl of conscience. All the negative karma they collected from the various unethical things they have done including banning Dorje Shugden, is all coming back. If the oracles start to chastise the CTA and its representative it is almost end game for the CTA. I think Nechung’s time to be the state oracle may be over, overhaul is imminent. This does not mean oracles system do not work, just that it is no longer working with all the wrong prophecies Nechung has manifested. Mind you Dorje Shudgen oracle advised the Emperors of China, perhaps it is the time that Tibetan state oracle be changed to Dorje Shudgen. The Michiavellian machinations by the CTA people in orchestrating Lukar Jam’s exit from the elections is clear for all to see. CTA need new blood and perhaps fresh elections, I mean what Tibetan should put their trust in Penpa Tsering and Lobsang Sangay? Thank you for this write up! Wow, it is getting from bad to worst: the corruption that is left to escalate, the humiliation to Tibet and its cause for freedom, the faltering faith amongst Tibetans and HHDL’s supporters and allies. For gods to get involved in politics is a practice considered obsolete in this 21st century.For gods to scold leaders of the Tibetan society is a scenario I hope is a practical joke because it completely degrades the good works of the Dalai Lama in the past decades. One positive outcome is the growing courage of Tibetans to express their thoughts. This freedom of expression may subject Tibetan leadership to be more mindful and less blatant and reckless with their actions. Thank you again for this news! It gives me a shock but not surprising as well..because Tibetan leaders are not doing much for Tibetans, either welfare or the progress of democracy. Facing all kinds of accusation, leaders still enjoy their happy days while ordinary Tibetans are suffering; and waiting and waiting for the betterment and improvement of their life, for Tibet cause. Protectors never telling lies. All Tibetan leaders should heed the advice Protector, or no the consequence to His Holiness’s health and Tibetan community as a whole will be definitely at stake. I only believe H.H Dalia lama. 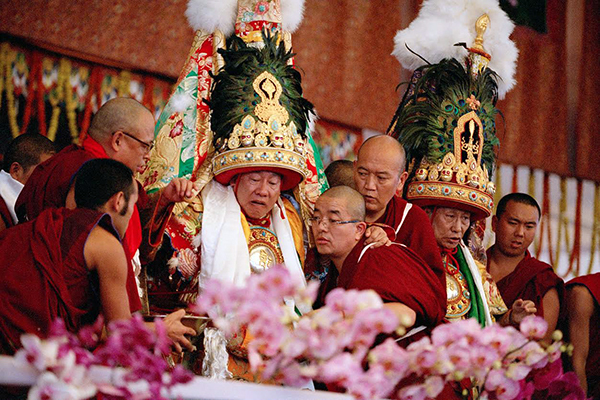 These gods and oracles (Nechung/Tseringma) are all promoted by His Holiness the Dalai Lama. At all major events and tenshugs, they are invited and take trance. So if you don’t like them, you are saying the Dalai Lama is wrong in believing in them? That’s right! The Dalai Lama is the one who consults Nechung and Tseringma oracles all the time. There are so many videos online that show them taking trance in front of the Dalai Lama. When I first saw this video, I am like finally the Gods and Goddesses speak up against the corrupt Tibetan govt. Everybody knows Tibetan govt is corrupt and bad. Just look what they did to Shugdenpas. You believe or not does not change the truth. Tibetan govt going down because the karma of doing many bad things and also doing bad things to Shugdenpas. A democratic country does not set a particular religion as the country’s religion because everyone should have the freedom to choose what they like. Having a Buddhist oracle to predict and give advice on government matters is therefore not comply to the practise of democracy. Some states in the US are on the watch to prevent violation of the constitutional ban on government endorsement of religion so that democracy is protected. Here’s an example http://www.reuters.com/article/us-usa-court-cross-idUSBRE85O0WJ20120625. The Central Tibetan Administration (CTA), however, continues its feudal system, ignoring democracy knowing clearly that the main requirement to accept donation from the Congress of United States is to run the “government” in a democratic way. Where is the slightest sense of gratification and respect for their kind sponsor? Does the CTA still qualifies for the donation? These are the questions we should all look closely so to protect the hard earned money of many who wanted the best for CTA. Another point to highlight is the necessity of having oracles since the CTA does not follow advices from their government’s protectors who are now showing their wrath and dissatisfactions for the “dirty” jobs Sikyong and Kanshag while in terms. It has brought to our attention that the CTA is not functioning democratically and nothing has been done to-date for the benefits of the Tibetans-in-exile. Otherwise, we would have seen a success in the Rangzen or Umaylam path by now, instead of the success of the hate campaigns on the Dorje Shugden practice that only do harm to the Tibetans. Tibetan is a society that emphasizes on spirituality and hence would have faith in the actions of divine beings such as Nechung and Tseringma who are loyal and trusted advisors to the Dalai Lama, the well loved leader of the Tibetan public. Hence, I believe that the open display of anger at Penpa Tsering and Sikyong Lobsang Sangya gave people the certainty, courage and strength to speak up. The video of the Gods chastising a pair of frightened and embarrassed Tibetan leadership went viral. People want this news to spread and did their part to expose the corrupt leaders that is taking the entire nation down with them if allowed. It is hopeful to see that the Gods still have their eyes on us to guide us, scold us and bring us back to the right path. I hope that the CTA and all its leaders will use this shameful event as a wake up call and right the wrongs that they have done to their people and supporters. It is shocking that even the gods have to get involved with Tibetan politics now. Instead of giving prophecies and advice for the future, they had to reprimand the CTA leaders. This is perhaps a sign of the progressive degeneration that will lead to the fall of the what is left of the Tibetan empire. The Tibetans, who are highly respectful of their lamas and leaders by remaining quiet in the past are now seen expressing their frustration with their leadership on social media, perhaps seeing the example showed by Penpa Tsering, whose video of criticising high lamas and teachers were circulating among Tibetans on the internet. The CTA’s inability to unite and create harmony between the Umaylam and Rangzen group is made worse with the further split due to the Dorje Shugden ban imposed by the CTA, as well as the strong regionalism and groupism sentiments. Sikyong Lobsang Sangay said in an interview in the early days that he envision a Tibetan society that is free of regionalism, sectarianism, and gender inequality, and that Tibetans must strengthen their unity by ending differences and discriminations of any kind. 5 years down the road, the Tibetans are more fragmented more than ever. I personally feel that the leadership’s own gods turning against them is long overdue. Many Tibetans were surprised at Dicky Choyyang’s resignation and the subsequent resignation by Dongchung Ngodup. These resignations made strong statements that even the people at the top were frustrated and found it pointless to even stick around and find a solution together with the current leadership. What Nechung said was very apt, that without rightful intention from the leadership, the leaders should take all the responsibility regarding life expectancy of His Holiness. His Holiness’ purpose to exist is to teach the Dharma and for the cause of Tibet. The current leaders showed bad example of criticising the most-valued ‘export’ of Tibet – the Tibetan High Lamas and their lineage/ practices, and paid more attention to their self-gain than the welfare of Tibetans, so why would His Holiness continue to exist for Tibetans? What can Tibetans do without His Holiness? Thank you for the article. I found the video of Nechung and Tseringma scolding Sikyong Lobsang Sangye, Speaker Penpa Tsering and CTA rather hilarious. Lobsang Sangye and Penpa Tsering have manipulated Tibetan election process to their advantage and it was very obvious. Even US Conggressman, Dana Rohrabacher, noticed the flaw in the election process and wrote a letter to the US Secretary of State and the Administrator for US Agency for International Development to alert them about the election irregularities. 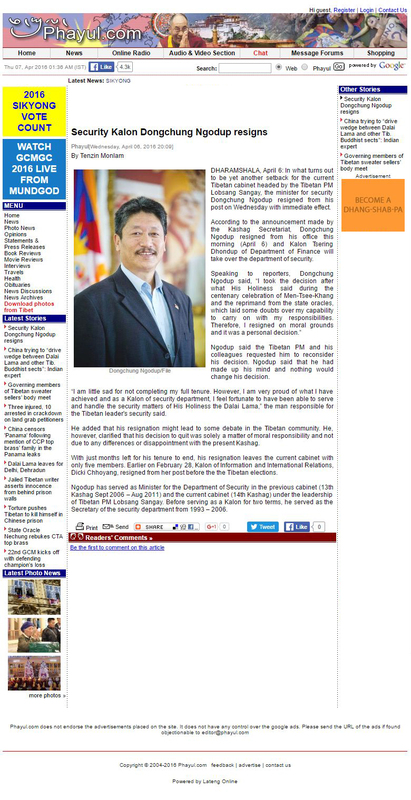 What a huge embarrassment for the sikyong, the speaker and CTA. Now with H.H. the Dalai Lama is reprimanding them, the deities are reprimanding them, their biggest sponsor, the US government noted their foul play, their people are making fun of them, the future of the current CTA administration seemed doomed. I hate to put it this way but its about time that someone spoke up! It doesn’t matter if it was the gods or people but anyone speaking up against CTA especially the corrupt duo Lobsang Sangay and Penpa Tsering. I hate to be the harbinger of doom but this along with many troubles are a sign of karmic repercussions swinging full circle from all the wrongs they have done against others. I wonder what they are going to do next. Already, the security chief had resigned. I wonder who else will decide to pull out considering the Dalai Lama is in poor health and the Tibetan people are at their lowest ebb of morale not seen since the dramatic exile from Tibet. Too bad they ban Shugden or they could consult Dorje Shugden for a reliable advice on how to proceed on. Just too bad! How embarrassing for the Tibetan Leadership to be so berated by their own protector gods, the very same who are care for the Tibetan peoples. When the divine needs to intervene it is a sorry state of affairs that the leadership has found themselves in. Given this fact, it just goes to show the level of corruption, greed and selfishness that mars their leadership. This has even been noticed by the international community, as I mentioned here: http://www.dorjeshugden.com/all-articles/news/congressman-dana-rohrabachers-warning-over-unethical-tibetan-elections/. To think that these people just want power and money over anything else is disheartening. The Tibetan population in exile are suffering so many ills. They are not granted the same rights as native Indians, due to their government’s insistence of having their own administration. They suffer tremendously. Added to this, whole swaths of society are discriminated against purely for their religious beliefs in Dorje Shugden. These people, some of who I am very close to and am proud to call me family by marriage, suffer from lack of these very rights, such as medical treatments in Tibetan hospitals in the South, or even the ability to go overseas due to lack of documentation. Traveling abroad means having an Indian Protectorate paper, and these have to be obtained by providing an letter of ‘No Objection’ letter from the Tibetan Administration. This obviously will not be provided to those who practice Dorje Shugden. This is just but one example of how the current leadership try to control the people they are supposedly serving. This corruption has found its way to the actual electoral process, which the protector gods here are berating the leadership for. A sad state indeed. The leadership is rotten through and through. Superstitious fools. They relied on gods for the last 60 years to give them predictions of the future and then didn’t follow the instructions. Or maybe they did, and those instructions were never meant to work out. Just look at the current state of the CTA. Terrible. It just goes to show there is no place for such superstitions in a democracy. In the end, the jealous gods turn against you anyway. This video is a huge downfall to the Tibetan leadership, even their gods are now ‘turning against’ them, that’s how much harm and disharmony they have caused in the Tibetan society including encouraging discrimination and segregation against Dorje Shugden practitioners. This is just part of it, there are a lot more ugly things they have done, therefore it is very important to get their nastiness to everyone’s knowledge. It is also very important for all the sponsors to know where their funds and assistance go to. In this case, it doesn’t go towards building more hospitals, monasteries and schools, but instead they use the funds to inflict more harm on Dorje Shugden practitioners, causing more troubles within the society. This is a very clear and bad example of a corrupted leadership. It’s too bad that the administration has deteriorated to a state where whatever they do is just pure corruption, then they put the blames on others for not getting their country back. But in fact, they are the biggest downfall towards getting their own country back. I am sorry but I don’t think we need to see this video of the oracles rebuking Lobsang Sangay and Penpa Tsering to know that the CTA politicians have been self-serving and corrupt. All you need to do is look at the state of the Tibetans in exile and open your eyes to the fact that the politicians have done nothing for the Tibetan people for over half a century. The only question why the gods waited so long to show their displeasure. The entire CTA is a sham anyway and therefore how can we expect those who keep a sham going to behave like proper mature and professional democratic politicians with the interest of the people in their hearts. Ultimate, are we supposed to believe that these Dalai Lama’s leaders of choice are supposed to lead the Tibetan people into freedom? How can the Tibetan people and Tibetan cause win any of these two corrupt politcians? What we are witnessing is the ripening of the Tibetan people’s karma for having consented to the destruction of a lineage, the desecration of the guru-student relationship, the defamation of an enlightened Dharma Protector and putting the Dharma at risk. Looking at how these CTA politicians are, regardless of the election outcome, the people will lose. The world needs to see this, and finally it happened. The Tibetans are not as “Shambhala” as what the world likes to see them as, their leadership and government are as corrupted and worldly as any other government in the world. Traditionally the deities/gods are usually consulted by the Dalai Lama and government for advice on big issues via the Oracles, and it still is like this today, and no even the gods are not happy with the top government personnel. So if people dont believe when they were told that the Dorje Shugden issue is a mess created by the highly incapable and problematic Tibetan government-in-exile, now the gods came to scold them for very bad things that they did, so now more people should be convinced and thus question the validity of the Shugden ban meted out by government of such “caliber”. Oh my goodness…. how embarassing and humiliating for the whole entire CTA that their two so called leaders are being reprimanded by their own Gods?! These two must have really down something really horrible and a huge disgrace to HH the Dalai Lama which I’m not surprise. I am wondering why only now the Gods are speaking up about them? They’ve caused so much lies, deception and suffering for so many of their own people. For one they created a segregation within their own people when they decided to mix religion and politics. When they decided to break and not give their own people their religious freedom rights to practice whatever they wish like Dorje SHugden, theyve already broken the law and basically killed a part of their own society/people. When they made it really really hard for Shuugden practitioners to even live in their own Tibetan exile community, they’ve already broken the laws of human rights and basically is leading their people in a autocratic/totalitarian leadership. So what makes CTA different from their own enemy China in how they treat their own people? No difference really. This time the world can see the kind of leaders Tibet have and if the Gods need to come down to tell you off, it must say something’s not right about these two characters. And isn’t Tseringma an unenlightened protector? Why is the Tibetan leadership relying on worldly protectors and yet they condemn Dorje Shugden saying DS is a spirit? Dharamsala really needs new leaders, one that is truly for the people and is democratic and accept all religions and unite their people. How sad to see that the CTA, who receives and has received over the years much support and help, cheats and lies to their own people. My feeling is that if people knew what is going on, a lot of the support would stop a lot. Westerners have grown up in democratic systems and they will not tolerate cheating and corruption on the very people the CTA is responsible for, the Tibetan people. What a slap in the face to be scolded in such a way by both protectors. Thanks to DorjeShugden.com to bring the news to the world. May the suffering of Dorje Shugden practitioners come to an end soon. From what has happened it clearly shows how the CTA has degenerated. If even the “person” who set them out for to do what they are doing right now beat them up saying that they are harming H.H. Dalai Lama’s life through what they are doing, it shows that the CTA is doing what they are doing and would crumble them from within. So who has the last laugh right now? With all that is being advised by Nechung, it is the same as what Dorje Shugden has always been teaching and telling us. Harmony and unity. With the diversion that is being caused by the CTA and the worries that have been caused towards H.H. 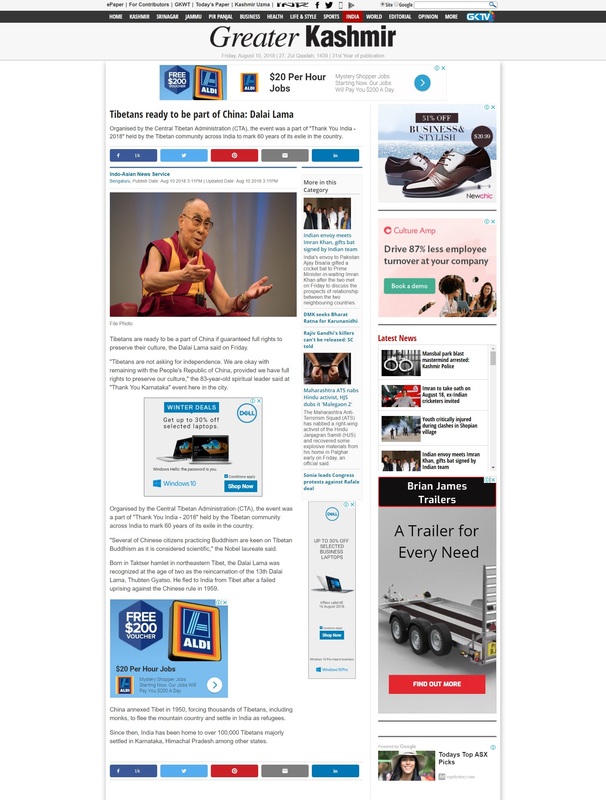 Dalai Lama, how will it be sure that with the current leadership it would benefit the Tibetans? It will not benefit them at any cause with the current leadership as they will only bring fall to what is being done right now. What the CTA should do immediately is to release the ban on Dorje Shudgen and repair their faults. Shugden is not banned at all by anyone. It was requested many occasion that Shugden should not be given the identity of Triple Gems and take refuge if you are Buddhist. Somehow Shugden followers who are wearing yellow robes committed heinous crime many times. Shugden monks did not hesitate to murder its opponents and also abused many Tibetans. They did not limit their crime in Tibetan community and as such Tibetans have to discard them. Reuter has proved that Shugden groups working for Communist China. Therefore, Shugden cannot be compared with our leaders. Oracles did not say anything about leaders if the translation is done properly. So no need to spread rumours. Space was, is and will be the one and only world order that is free of lastingness and non-existence. There is no other world order than space. Conciousness is rooted in space, therefore conciousness is free of lastingness and non-existence and only belongs to the limitless empire of space. All beings only belong to the limetless empire of space and definitely not to a religion or state/republic. This means we are all free anyway, no matter if some beings get this or not! Ignorance, duality, eternalism and nihilism, thougts and emotions never ever has, have or will be able to rule this world and their beings that live in this world! Only wisdom an compassion can rule, can liberate, can effect freedom and wellbeing. No religion, state/republic can do this! Some people might want you to believe this Illusion and want to prevent you from realizing the truth by ignorance, duality, eternalism and nihilism and so on, but it can’t change anything about the truth at all! Freedom and wellbeing comes from your own wisdom and compassion and not from religion oder state/republic, because freedom and wellbeing is up to our our conciousness that is rooted in space. Mind ist free of religion and state/republic, essence and nature of mind is wisdom and compassion. Nothing can change this, look at history of mankind! Religion, state/republic is rooted in ignorance, are dualistic systems, are eternalstic and nihilistic, are only about good and bad, god and devil, peace and war, rich and poor, knowledge and belief, right and wrong, white and black, this and that and so on – that’s kindergarden stuff and not dharma/shunyata. So don’t go with the kindergarden systems religion/state/republic etc., stay with space, samaya with space is important. Religions, states/republics are coming and going like clouds in the sky, they are not the problem at all. Let them come and go, just don’t go there, don’t follow the Illusions, don’t follow the path of suffering, follow your own wisdom and own compassion. May the King Samatabhadra and Queen Samatabhadri, the one and only Leaders of all Worlds in this limitless space, take care of all of you, protect you with their wisdom and compassion until you are fully free and well. May Vajrasattva and Vajratopa lead you, guide you, protect you and stay forever firm with you, untill you realized the Kingdom of wisdom and compassion the kingdom of freedom and wellbeing. May the teachings of Samatabhadra and Samatabhadri, Vajrasattva and Vajratopa, wisdom and compassion of space and mind, the teachings of the victorious ones, flourish, grow and dispell the Illusions of Ignorance, duality and all eternalstic and nihilistic views in all realms of present and future. My heart, my dharmapala is strong with all of you in this life and all future lifes. Let your mind be mindful, so that you mind can become be aware of wisdom and compassion, so that you can study and practice dharma, so that you can be free and experience wellbeing. Dear Brother, Raju Tashi, wether shugden is banned or not you know that they are also buddhist. what the Oracel tseringma did in the video shows clearly that it is not satisfied with what is going in tibetan government issue. it can be corruption or can it be issue that lots of discrimination done to innocent shugden followers for the shake of freedom of tibet despite being able to solve the internal affair of tibet. Shamless. I hope this is a strong wake up call to the Tibetan community in exile to speak up and question their leaders. If the Oracles who are divine in nature and only wanting the best for the community are outraged by the behavior of the CTA, namely the prime minister and the speaker of the Parliament, then it is a clear indication that these leaders are doing a terrible job. Interesting to come across this article here. I think it’s embarrassing when leaders have to be reprimanded by gods, and we are talking about both the state oracles of Tibet! I guess the gods can’t help but to put a stop to the leaders due to their misconducts in the general elections. Both the deities have said that they cannot guarantee the life span of Kundun if the Tibetan people and their leaders are not observing his wishes. Trust me, it’s not only the gods who are angry. Kundun is not happy, and many of us Tibetans are also not happy. It’s very obvious when Kundun spoke about the worsening state of affairs within the Tibetan society, particularly the health in the settlements, during the 100th anniversary of Men-Tsee-Khang in March, who is the ones at fault. Let’s see what the Sikyong does this term. This is just a blatant fact that CTA is corrupt and not doing their job. They are the ones who split the Tibet community with corruption and notably by discriminating, spliting families, killing and abusing the Dorje Shugden practitioners during this ban. Even Gods and Deities are not happy with CTA now. It’s the worst i have seen. Many are still out there suffering and yet all CTA concerned is how to accuse all Dorje Shugden practitioners are spies from China! Grow Up CTA! Oh my! It was such an interesting read and what a spectacle to watch of the video on the Oracle, Tseringma berating the corrupt officials, Lobsang Sangay and Penpa Tsering. They must have thought themselves unstoppable and now received such public humiliation and scolding from the Oracles. Their manipulation and corrupted actions were getting so overboard that even the US Conggressman, Dana Rohrabache (US is a big sponsor of HHDL and his people in exile) showed concern of their manipulation in the election process. Imagine if US was to stop their sponsorship!! As the Oracles had ordered for the CTA to work on uniting the Tibetans, wouldn’t that mean to lift the illogical ban on Dorje Shugden as it will reunite all Tibetans instead of the segregation it brought. Well one thing is for sure, HHDL’s health and life is in the CTA’s hands (as it has always been…they are HHDL’s students) and has never been due to our propitiation of Dorje Shugden who had helped HHDL so many times. Through all the evidences of the mismanagement by the leadership of the Tibetans in exile, one point from early in the article calls to me. “Therefore, in the future If you are not able to give assurance to His Holiness about your rightful intention ahead, you Leader should take all the responsibility regarding life expectancy of His Holiness.” – quoted from the translation of the Nechung Oracle’s letter. This may be conveniently pinned onto Shugdenpa’s shoulders again instead of acknowledging their own deficiencies. The Dalai Lama’s life expectancy is shortened due to the “worship of Dorje Shugden” instead of their own actions that caused it. Oh, well, that;s the blame game, the direct opposite of what I thought Buddhism is all about – cause and effect. We take responsibilities for our actions and take steps to overcome our negativity, our obstacles or face the effects of Karma wither in this life or in future lives. Being this age and times, I guess Karma may bite back earlier that expected. That;s why in the US, whatever you may want to bash them with, the forefathers got it right when they separated Church and State. To me, it is very bad news for the Tibetans in Exile. Things are not looking good. My sympathy goes to the Tibetans who have relied on their corrupted leaders for 60 years. With all the financial help from so many countries for so many years, CTA is not able to steer their “country” to success, and with all these embezzlement from the leaders, I wonder if the sponsorship from other countries will be reduced or even stopped. But what can the Tibetans do? They are mostly not educated, they only listen to HH Dalai Lama and cannot think for themselves. The leaders purposely do not want to educate them to stop them from thinking for themselves. From what I see, the Tibetans are pretty doomed. It is very irony. HHDL, the Nobel Prize winner and ambassador of peace, with His teaching spread all over the world, is not able to teach His own people about kindness. HHDL’s leadership are all very selfish and only work to benefit own self and not the Tibetans. It is indeed very sad to see the current state of Tibetans in Exile. And they need to stuck with this leadership for the next five years. I really don’t know what to say, except by saying, “Good luck”. The CTA is not capable of planting the seed of and implementing real democracy where freedom of speech, differences in opinion, and constructive feedback can be accepted. Tenpa Yarphel is being called a Chinese dog just because he said Nechung’s prophecy is inaccurate.